Now why would a single fisherman need so many nets? Actually, we don't know if they all belonged to him, but there are at least 12 nets on that pole and I have a fairly good hunch why he would need so many. You see, we stayed in this hut along the edge of the lake. 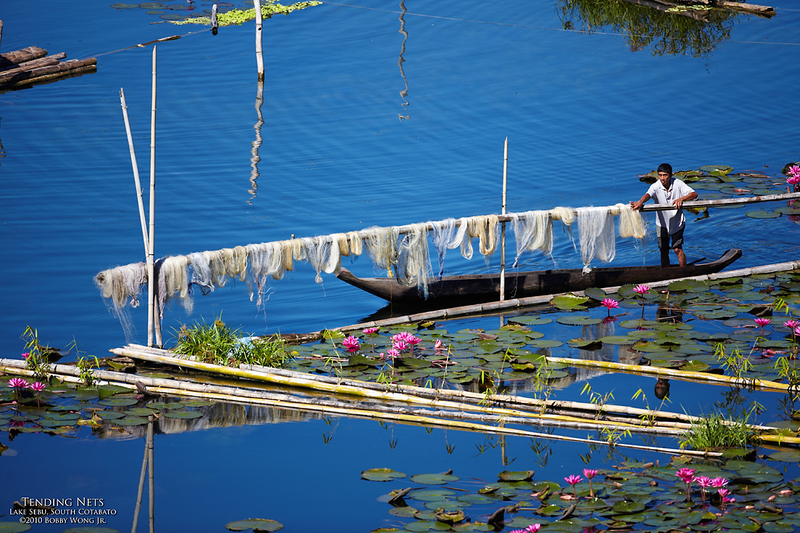 And in-between shoots, while lounging around enjoying the view, we observed them darting across the water on their dugout canoes, collecting small fish trapped in these nets they'd strung along the pathways between fish pens. Several times a day they would row along the length of these drift nets, lift them out of the water a section at a time, and find an unlucky 6" fish tangled in it. There would usually be only one or two fish in a net about 8 or 10 meters long. To provide three full meals a day for an average family of five, would that explain why they need so many nets? Enjoy. Where in the world is the Lake Sebu in South Cotabato?